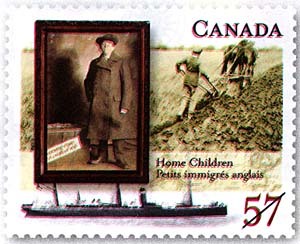 On September 1st, 2010, Canada Post began issuing a stamp raising awareness about Canada’s role in the British child migration scheme. In 1869, Annie Macpherson, distraught over the working conditions of child slaves in her country, came up with the idea of sending them overseas to better conditions with welcoming families. While some children may have benefited from the change, many ended up abused, exploited, or overworked as domestic servants. One of the child distribution centers in Canada was located in Knowlton, Quebec, not far from the offices of Arpin Philately. Some countries, such as Australia and Britain, have issued apologies to victims of the British Home Child plan. The government of Canada, while refusing to issue an apology, has proclaimed 2010 the Year of the British Home Child. Hopefully this will provide some comfort to families who descended from Home Children. Elizabeth, I guess you would need Canada Posts approval to use this stamp for publishing.